Direct Democracy: A valid future? I voted for Big Brother, but I didn’t vote the Prime Minister in. What’s the point of e-voting? Where’s the free e-democracy project? I happened to hear a bit of BBC Radio 4’s World at One yesterday. Presenter Martha Kearney was trying to explore the issue of manifesto promises: Does legislating on them help (as per the Conservative’s announcement on taxation yesterday), how often are they broken and do people actually trust the promises made. In service of this topic she interviewed Labour’s Rachel Reeves and the Conservative’s Michael Gove, both senior national parliamentarians for their respective parties. Rachel Reeves spent most of her interview mentioning reams of the promises Labour are making in their 2015 manifesto, while avoiding the questions on her party’s past performance. Meanwhile Michael Gove kept wanting to rehearse in detail his party’s past achievements while avoiding Kearney’s exhortations to expand on the promises they were making for the future. It seemed a rather odd and unsatisfying set of encounters for a rather key point central to electioneering: the manifesto pledge. Apparently we are seeing huge pledge inflation, more pledges are being made and manifestos are getting fatter than ever. But what value are pledges when future circumstances are likely to change? And can we make any judgements for their future governing based on parties’ past performance? Mr Gove justified his desire to rehearse his party’s record in government on this very basis, that because (in his view) they had delivered on previous promises their future ones could be trusted. Then why legislate your tax pledge was Ms Kearney’s rebuttal. I don’t think manifesto pledges can be the only part of electioneering, one should also be considering for example the personal values and judgement of future representatives. But past performance, where available, is also a useful metric if not a guarantee of future progress. So in the spirit of openness I published the Green minority administration’s record last week. On election four years ago we almost immediately began tracking the 195 pledges we’d made in our 2011 manifesto. By our own judgement we are on course to deliver over 85% of those pledges. I think that’s pretty a good result for a minority administration running a council for the first time in our party’s history during a period of unprecedented austerity cuts to our budgets. But I might be biased! What’s interesting is how few administrations locally or nationally produce such end of term reports, nor do independent bodies provide such analysis either. If we are seeing ever more pledges being made, then that does give ever more opportunity for such progress reporting to be done. Perhaps something for FactCheck, IFS and others to consider for 2020? You can download the full PDF Brighton & Hove end of term report here. Much has happened in 2014 to put Brighton & Hove on the map. After working with our neighbouring areas – including councils, universities and businesses – we won ‘City Deal’ status from government, bringing millions of pound of investment to our Greater Brighton region. This includes government funds to upgrade the facilities for technology and digital businesses at New England House. 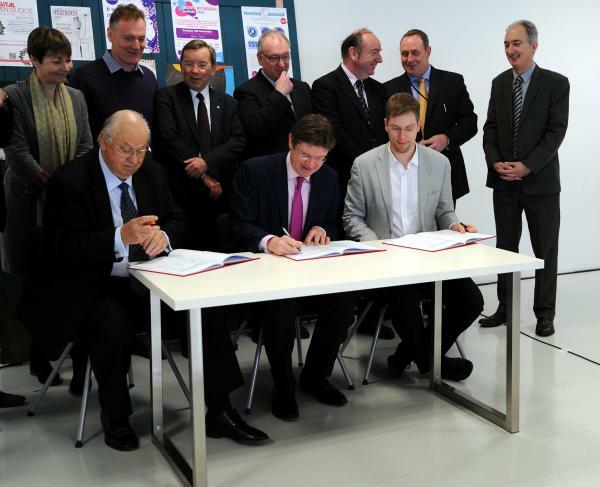 We’ve worked very closely with the Coast 2 Capital Local Enterprise Partnership and Wired Sussex to win a number of big investments from government and Europe. Particularly close to my heart was winning a Digital Catapult Centre for Brighton. In the summer we were also named the third best city in the country for small and medium sized businesses to grow, and we had record visitor numbers of 10m people coming to the city. We hope to keep growing that number having started work on building the iconic i360 observation tower and begun the process of building a new world-class conference centre as part of the ‘Brighton Waterfront’ project. Digging the first sod for the i360. Once we got out of the way they opened up a vast hole below for moving a sewer tunnel and laying foundations. We won the City of the Year Award in Europe, for our work on sustainable travel. Figures this year showed that the number of people killed and injured on our city streets had fallen – meaning our work to improve travel safety is paying off. This year we also opened two new libraries at Woodingdean and Mile Oak, creating new community hubs for residents to access books and the Internet at a time when most other councils are closing them. We also pioneered, with Sussex Police and Rise, drop-in domestic violence surgeries in council customer service centres. Selfie outside one of our new libraries. I started chairing the Health & Wellbeing Board this year, which was significantly reformed to bring together health and council colleagues together on an equal footing for the first time. 2014 has not been without its challenges, but 2015 brings opportunities to address them. Council officers are working on redesigning the refuse and recycling department to give residents an improved service. Work is also due to begin on a permanent travellers’ site, which will help reduce the unauthorised encampments that have disrupted residents and businesses for many years. The council is consulting on what is going to be its toughest budget yet, now that our government funding has been cut by some 40%. The debate comes to a head in February when councillors will be agreeing the budget and deciding how best to fund and provide services for residents for the year ahead. After years of dwindling funds for local services, this time mounting government cuts are going to hurt. Combined with the general and local elections in May, it’s certain that 2015 will be an extraordinary year for our city. My best wishes to you all for the New Year. The Coalition Government’s relentless cuts to councils, led by Secretary of State Eric Pickles, has created an extraordinary situation: Councillors of all parties across the country are united in their disgust at the way in which councils are being treated. In recent days alone we’ve heard the Conservative Chair of the Local Government Association, Sir Merrick Cockell, warn once again of the devastating effects of the continued austerity measures imposed on councils. Sir Merrick’s successor as LGA Chair, Labour’s David Sparks, has also this week spoken out against the unsustainable funding situation facing council services. Meanwhile similar warning’s are being issued by the Association of Directors of Adult Social Services (ADASS), the Rowntree trusts and many more. There is a great deal of unity in expressing our deep concern about these national policies. We know we are only halfway through the government’s austerity programme, one which is set to continue regardless of who forms the next government after the general election. But when it comes to the local decisions of how to best cope with these cuts, the differences start to emerge. Even experienced opposition councillors, who know options are few, can’t help themselves but blame the situation on whoever the incumbent party is. Local voters are too busy leading their lives to notice that across the country council administrations of every political hue are being forced to cut back. All councils face the same crunch: Huge year on year reductions in government funding whilst service demand grows as the population increases, ages and health needs grow more complex. In Brighton & Hove we face a £25 million hole in our budget for the next financial year, £18 million of that as a direct result of government cuts and the remainder due to increased pressure for our services. As a Green minority administration we are committed to protecting the essential public services that our citizens depend on. So we will continue with a ‘value for money’ efficiency programme which has saved tens of millions so far. But that won’t be enough so we are also proposing a 5.9% council tax increase for next year. This is equivalent to £1.48 more per week for the usual comparator of a band D household, though the majority of homes in Brighton & Hove are in bands A to C.
This increase won’t plug the hole completely, but it will give us enough breathing room to retain public services, particularly social services for adults and children. We know that by making such bold proposals there is much greater engagement by residents in the realities of the huge challenges facing council finances. As the debates developed we’ve seen many agree that a greater contribution through council tax is needed to protect the services they value. Opposition parties will continue to utter empty platitudes about the need to be more efficient and cut down on management, but citizens deserve better than such comments which could never plug our budget gap. We’ve saved tens of millions in efficiencies already, and reduced management spend to its lowest ever. Rather than having a go at each other, residents need their councillors to work together on the huge challenges ahead. As a Green I’m committed to protecting public services, reducing inequality and improving my city’s wellbeing. These are particularly tough challenges at a time when budgets are being squeezed so hard. Yet I do believe that by backing a 5.9% tax increase we can keep supporting those in need while keeping Brighton & Hove great. 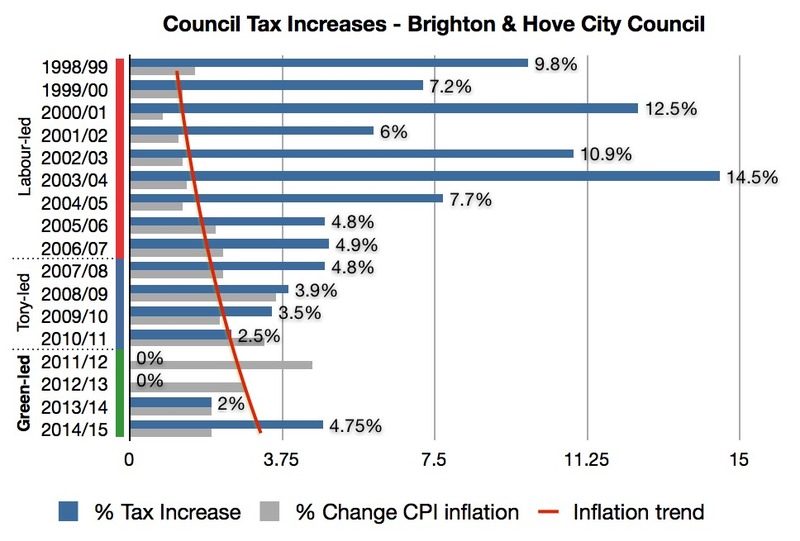 This is the second and concluding part on why now is the time for the citizens of Brighton & Hove to be asked whether they will support a 4.75% tax increase to protect council social care services. Part One is here. So in the face of this we do need to find more efficient ways of working – we have no choice. But we also need to raise money. We are looking at new ways of generating income, but those will take some time to pay dividends. More immediately we could increase fees and charges, but this isn’t always desirable, could only go so far and couldn’t possibly raise enough. So the last option we are left with is council tax. It is an option that Eric Pickles has done his best to undermine and control local decisions with gimmicks like a ‘tax freeze grant’ and by adding an ‘excessive tax threshold’ over which councils are forced to seek permission for the increase through a referendum which can only be held after tax bills have gone out. However for all its many imperfections, those with the biggest homes do pay more council tax and the poorest do get help paying it through our discount scheme known as ‘Council Tax Reduction’. First though we need to understand the recent history of council tax in the city. In the last year of the Conservative administration they originally proposed a -1% council tax reduction, but this was amended to a freeze. Labour had originally agreed with us to still refuse the overall budget and revisit some of the other options. Sadly in the end Labour reneged, and supported the freeze. The next year Labour passed an amendment, backed by the Tories, to our first budget reducing a 3.5% council tax rise down to a freeze. 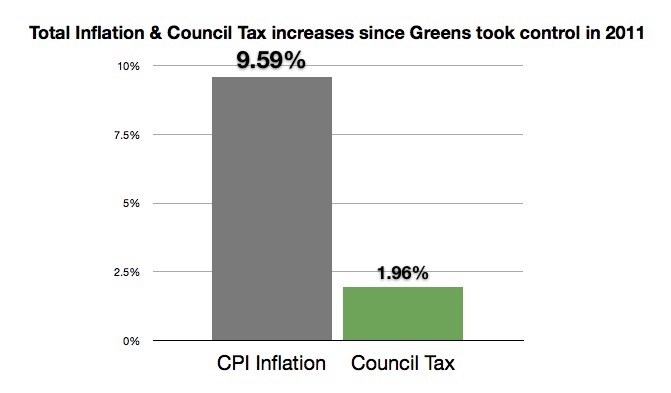 It was only the year after that Labour, at the last moment, decided to support a 1.96% council tax rise. As you can see, in real terms one of the only sources of income the council has influence over, is hugely behind inflation. It’s so far behind that it barely scrapes the surface of growing demand and government cuts. The imposition of a freeze by Labour and Tories in 2012 alone means that we have £3.7m less in the 2014/15 budget. Indeed we have cumulatively had £8.5m less since 2012 when compared with what our 3.5% proposal would have done. This additional income would have quite probably meant that we could have kept to a 2% rise for 2014/15. Many warned that freezes back then would lead to higher tax increases later, and this is proving to be case. Smaller, regular increases as we proposed was responsible, long-term thinking. Sadly, as Eric Pickles knew, too many were unable to resist the temptations of the short-termist freeze approach. Clearly Labour’s tax rises were far above inflation, while ours have been significantly below, even if the 4.75% proposal was to be agreed. And this was during the time of plenty. 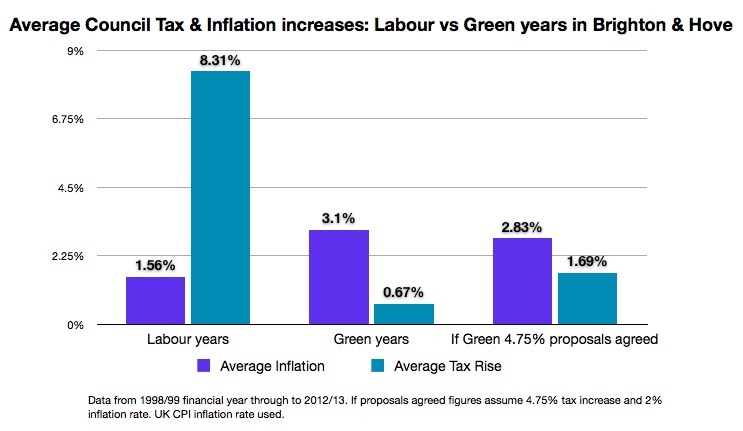 So in real terms council tax bills have been declining in value under Greens. It’s important to note that the first budget of each administration is actually set by the previous administration just before the elections. So the 2011/12 budget, which we had to implement, was set by Tories in February 2011 just before we became the largest party in May 2011. Clearly no party represented on the council today was averse to tax increases at one point or another when they were in charge. That continues to be the case: Right now we see Conservative-led councils like Kent advocating 2% increases and Sussex’s Conservative Police & Crime Commissioner just approving a 3.6% increase to her precept. Labour councils are seeking tax increases too and we see Labour council leaders backing our referendum proposal including from Preston and Brent. What would our proposal cost? Setting aside Police and Fire precepts, which we don’t control, for our 4.75% proposals the majority of households would pay an additional £4.53 or less a month. It would raise £2.75m more than in our draft budget from December 2013 when we planned for a 2% rise. The extra money raised would go exclusively to protecting Home Care, Community Care, the supported employment service ‘Able & Willing’, and third sector grants. The nature of the budget and referendum processes mean it will be cast iron that the additional money raised would have to go to those services. So there we have it. Our population is ageing, adding significant additional pressures on council budgets as we strive to deliver the care our most vulnerable deserve. We have an unprecedented scale of government funding cuts – which councils and political parties across the country agree is setting us up for a huge funding gap. And lastly, we have in recent years locally seen council tax fall well behind inflation meaning that it is not really contributing to relieving our intense funding pressures. Social care is the council’s biggest area of spending, and is responsible for the most vulnerable in our society. The picture I’ve painted above shows that carrying on, even with the most clever efficiency savings we can possibly deliver, will mean a severe reduction in what care we can offer. I hope that isn’t what we want for our society. But now is the time to have the debate. The referendum process defined by government is imperfect, but it’s all we’ve got right now. Some in the media want to skip straight to whether people will vote for or against the referendum question. That’s premature, right now we need to debate the reasoning for the referendum as I have set out here. We must discuss the principle of letting the city decide at this critical juncture for the future our public services, otherwise we risk this precious opportunity being rejected out of hand by a few councillors. Debate continues on Twitter under #bhbudget #brightondecides and #LetThePeopleDecide – join in! The Brighton & Hove Independent are hosting a free public debate on the social care referendum on Monday 10th February at 7pm. Free tickets can be booked here. There has been much political analysis in recent days over the ‘real’ reasons why I announced the Green administration’s plans for a social care referendum on a 4.75% council tax increase. Opposition parties have tried to throw as much sand in the eyes of the public with a colourful array of false and misleading claims. I won’t dignify them further other than to say how unedifying it has been to see political leaders doing everything they can to avoid debating the genuine issues at hand: the huge financial pressures councils are under and the growing uncertainty over how social care can be provided into the future. Let’s be clear, the reason I’ve proposed a referendum on a 4.75% tax rise for social care is because I think it’s the right thing to do. Let me now explain why in more detail. In 2011 we made a commitment to publishing early drafts of council budgets to facilitate the consultation and engagement process. Every year so far the final budgets have changed for the better as a result of this process. It’s the right way to do things when we have to decide on the future of important services for our city. We did the same again this year and the feedback from the public, service users, advocacy groups and unions was clear. They were very concerned about the impact of budget cuts on the third sector and social care in particular. They’re not alone – the majority responding to the council’s budget questionnaire wanted funding to be maintained or increased for local services. Yet because of government cuts and growing demand for our services , we will have to spend £23m less for the coming 2014/15 financial year. The gap between funding available and funding needed for existing services is incredibly stark: This is not for new or extra services – but just to keep things going. In local government circles this has been debated, with increasing angst, for some time. But it’s sadly the case that too little of this reality has entered public debate. So the problems of funding cuts are real, are being expressed loudly by all parties and are already hurting local services across the land. In part two I will look in more detail at the particular situation we find ourselves in Brighton & Hove and why I believe our proposal is the right way to proceed. UPDATE: Part two has now been published. Meanwhile debate continues on Twitter under #bhbudget #brightondecides and #LetThePeopleDecide plus comment pieces have been published by Local Government Chronicle editor Emma Maier, The Guardian’s Simon Jenkins and others as well as lots of excellent blog posts. A version of this article was first published in the Brighton & Hove Independent. Readers will know that public services have for the last few years seen significant government cuts. Here in Brighton & Hove we have so far been successful in protecting essential services by saving tens of millions of pounds through genuine efficiencies. But darker storm clouds are on the horizon. Councils are facing what many are calling ‘a cliff edge’ in funding, and as a result huge chunks of services could disappear. Simply put, we can no longer absorb all of the government’s cuts whilst also meeting the increasing demand for our services from a growing yet ageing population. Nationally councils have seen a 38% reduction in funding compared to Government only 8% trimming of Whitehall departments. And sadly, per head of population, Brighton & Hove has been one of the worst hit councils in the country. We want to offer you, the residents of our city, a choice: accept the full weight of austerity cuts imposed on Brighton & Hove by Eric Pickles or else cast a vote for a fairer and more compassionate society. Let the coalition cuts take their toll, or agree to pay a little bit extra each month to fund care for older and disabled people in our community and protect funding for the city’s charities. The increase in council tax we’re asking of residents will not only save services this year, but will improve their security for years to come. If agreed, the money will specifically go towards supporting home care, residential community care, day services, support for those with learning disabilities looking for work – as well as protecting grants to the city’s third sector. The elderly have worked hard all their lives and deserve our continued support in their old age. And the city’s charities, social enterprises and not-for-profit organisations also provide essential services across all our city’s communities. We know that investment in our third sector benefits the city and residents many times over. Without additional funding, the Coalition’s cuts will seriously impact upon some of the most vulnerable people in our city. We think it’s right that we trust the residents of Brighton and Hove to decide what they want from local services – particularly given the financial situation is so different to that when they voted in 2011. So we want to hold a citywide referendum in May 2014 on whether we should raise council tax by 4.75% for the coming financial year. We ask the people of the city to vote in favour; to reject austerity in Brighton and Hove and help us to preserve a more compassionate society, one which cares for older and disabled people, supports social enterprises and protects the not-for-profit sector that is so vital to so many in our community. The full announcement of the referendum can be viewed here. The past year has been a challenging, but good, year for our city. We continue to outpace the national economic recovery with rising employment figures, low levels of shop vacancies and visitor numbers continuing to do well. Our schools, colleges and universities are all growing and outcomes are improving, indeed this year saw record GCSE results against a nationwide downward trend. 2013 saw Brighton & Hove Albion and the city council, win the right to host 2015 Rugby World Cup matches in the Amex stadium. The city’s wonderful Festival and the Fringe both had record years, and our museums have been doing very well. Public art and photography have continued popping up across the city thanks to a diversity of projects. Pride was better than ever this summer, and has plans afoot to do even more next year. The Brighton Marathon also had a bumper year and announced exciting plans for 2014. And we saw a Royal visit to open The Keep, our new public archives in Falmer. Nevertheless our wonderful retail sector faces challenges as shopping habits change to online and household disposable incomes continue to feel the squeeze. Sadly many have less in their pockets each week, not just in inflation-adjusted ‘real’ terms as economists say, but because of sustained government cuts to welfare. Whilst most agree the welfare system needs reform and simplification, little of that promised change has happened. So far we’ve just seen measures that by 2015 will have taken £15 billion out of support for the poorest. In many cases councils are picking up the pieces. For example the benefit cap costs the council £1m a year to keep families in their homes and prevent homelessness. The government is celebrating the reduced benefits bills, whilst we, the local taxpayers pay the price. These years were always going to be challenging for local councils. With an ageing population and a baby boom, we have more demand than ever before. We are helping thousands more people each year through our 800 council services. This increase alone is a pressure of £10-15m a year. Yet, we have a government not just failing to recognise and help us with that growing demand – but cutting our funding, making the situation worse. By 2015 councils will have seen a 40% cut in funding just as their services are in greater need than ever. Unfortunately the austerity consensus between Tories and Labour in Westminster means that this situation will only continue. We have to do the best for the city in the circumstances – so what has been happening? Many readers will have noticed the major transport improvements completed this year, thanks to external funding from the Department for Transport and others. The Lewes Road and Seven Dials have been transformed, improving safety for all. Brighton & Hove remains one of the ten worst areas in the UK for road safety, so more work is needed. We’ve also been successful in rolling out 20mph limits where residents support it. Thanks to these transport measures we’re seeing walking, cycling and bus use all growing significantly – crucial when we have more and more people living, working and visiting the city. We’ve taken made major progress on big developments in the city We’ve moved forward with the University of Brighton on developing Preston Barracks, and announced our plan to sell our seafront headquarters, Kings House. Lots of building has been underway such as the old Co-op on London Road, ‘Block J’ behind Brighton station, Woodingdean’s new library, the Brighton Housing Trust container homes and the Amex stadium expansion. We’ve also completed a major refurbishment of the Withdean Sports Complex and a number of council offices. Part of this involves working more closely with other public sector organisations – for example we now share Hove Town Hall with Sussex Police. Our parks and open spaces have seen lots of work this year too including installing chalky ‘butterfly banks’ and the revamped facilities at The Level . It’s been a busy year for negotiating with government. After winning money for ultrafast broadband in late 2012, this year has been spent pushing government to let us spend it as they wrangled with suppliers and the EU. This was finally resolved a few weeks ago so 2014 should be an ultrafast year for the city. We’ve also been negotiating with government for a ‘City Deal’ to support the so-called Greater Brighton region. Clearly our residents’ lives don’t stop at municipal borders – so it’s important that we work with our neighbours to make progress together. At the time of writing we are very close to sealing an agreement which will support key developments across the city region to unlock economic development and empower our area. This year we also completed the long overdue process of ensuring equal pay for all council workers. This should have been done more than a decade ago, but the political and logistical difficulties of doing so meant it was never fully tackled.. I know how difficult and unpleasant the dispute and subsequent strile was for all involved. But the end result is we now have clear and fair pay and allowances for all council workers and we’ve avoided the risk of legal challenges which could have left the council bankrupt. We’ve also had great success with the living wage campaign. The council was accredited as a living wage employer this year, and a few weeks back the campaign celebrated over 100 local employers providing a living wage or more to all their staff. The campaign is led by the city’s Chamber of Commerce with council support, the only campaign of this type in the UK. Thanks to its work, over a quarter of the living wage employers in the UK are right here in Brighton & Hove – a wonderful milestone. In April we were recognised as the world’s first One Planet City by sustainability charity BioRegional. This means our plans to reduce our environmental impact have been independently assessed to be credible, but we’ve still go to do the work of implementing them. That work is well underway. We as a Green Group of councillors published our mid-term report in the Autumn which showed our strong record of delivery since May 2011. Three quarters of our manifesto commitments have been done or are on course to be completed. Straight after that the city hosted the Green Party conference in the city, followed by the Labour Party conference – both great for the local economy. Looking ahead to 2014, we’ll need to complete the very challenging annual budget process for the 2014/15 financial year and start preparing for the 2015/16 council budget. There are no easy choices left for councils. But I’m committed to doing the best we can for citizens with whatever government leaves us in our spending pot. In 2014 I hope to be signing the Greater Brighton City Deal with government and seeing developments move quickly after that. Almost immediately we will be working with our Local Enterprise Partnership to negotiate a ‘Growth Deal’ between government and our region. This will be our main source of funding for transport projects in the city in the future, a successful deal is crucial. Meanwhile we’ll be completing the rollout of communal recycling and pay by phone parking in the city. We also have major work to do on the seafront ,balancing our local economy whilst finding the £100m cost of maintaining the rapidly ageing structures holding up the promenade. Another absolutely key task is transforming social care and the local health system overall. Almost everyone agrees that council social care and the NHS need to work better together to improve services for our residents and make sure it’s affordable. Many challenges and opportunities lie ahead in 2014. We will keep supporting those in need, helping local businesses and charities while delivering services. Brighton & Hove moves into 2014 in a strong position, with a creative energy ready to surprise and impress as we continue to attract visitors from far and wide. Merry Christmas and a Happy New Year. During our term of office the Green administration has been working hard to keep lowering the council’s costs and reducing our carbon footprint. A major part of this work has been focussed on the buildings we use. Brighton & Hove City Council was formed from the merger of a number of different councils which themselves had amalgamated others bits of councils further back in history. So it’s no surprise that there was quite a spread of properties, of varying quality and value, in us. As the government continues to cut council funding our staff numbers are declining through voluntary severance and recruitment freeze. This and technology allow us to dramatically reduce the number of buildings we need to provide council services. This programme of rationalising buildings is called ‘workstyles’ and began under the previous Conservative administration. Greens have accelerated this work, linked in more IT and service modernisation plus greater ambitions for sustainability. The final phase, number three, is the biggest and most important. It covers a very significant number of staff and some of our largest, most high profile, offices in a programme that will take 3-4 years to complete. As we are a no overall control council and this work will extend into the next 4 year term, all party leaders have been briefed on the plans. This started in earnest just over a year ago leading to a decision at Policy & Resources Committee in October 2012 which set the principles for this phase. The key principle being that the entirety of our Kings House offices would be sold to fund either moving entirely into Hove Town Hall or into part of Hove Town Hall plus another unidentified building. Either way the decision was clear that savings (in cash and carbon emissions) could only be made with the investment of the capital that selling Kings House would provide. This was agreed with the support of the Conservative councillors on that committee. The very significant work that decision required has now been done. The clear recommendation from all the analysis is to move remaining staff entirely into Hove Town Hall. As this programme is key to saving the council money, enabling major service redesigns and essential IT investment, we didn’t want to delay. So with cross-party agreement I called a special meeting of the Policy & Resources Committee for this month specifically so that we could crack on with the Workstyles phase 3 programme (otherwise there wouldn’t have been a scheduled meeting until mid-October). Last Monday the party leaders met for our monthly Leaders’ Group meeting and we discussed Workstyles. There was no suggestion of any concern about the report, just some questions about some of the planning that would need to happen whilst building works were underway and what the refurbished Hove council chamber might be like. So it was with considerable disappointment that on Wednesday I learnt of a Conservative amendment to the plans through Brighton and Hove News — the next day the Tory leader Geoffrey Theobald sent me the full text of the amendment which aims to tear up the workstyles programme by putting a school on the rear half of the Kings House site. It somewhat renders the year of briefings and discussions pointless if a party is going to then opportunistically seek to amend at the last moment via press release. Even more so when the Conservatives voted for the principle of selling all of Kings House off less than a year ago! Workstyles is essential to the council’s financial future as well as its ability to meet the challenges of changing demand. You’d think Tories, who started it, might understand that! Instead they want to offer up the most valuable part of Kings House to a free school who I understand they have already lined up a sponsor for. If their plan went ahead it would totally shatter the financial savings and it would eliminate the opportunity for a significant amount of much needed affordable housing to be built on the site. Furthermore, because of the nature of the Workstyles programme’s need for works to happen elsewhere first, the site couldn’t open as a school before 2017 at the earliest. Having had discussions at the end of last week I’m pleased that the Labour group leader Warren Morgan has confirmed that he, like the Greens, will oppose the Conservative approach thus allowing this important project to move forward unimpeded. Yes there is currently pressure on school places in the West of our city. But lots of work is underway with school expansions and already approved Free Schools getting going. A last-minute Tory attempt to make an essential and very long-term programme about schools is deeply opportunistic. It also undermines the whole point of repeated cross-party briefing to find consensus in our times as a no overall control council. As Council Leader I will keep working hard to find open and consensual ways of working cross-party so that we can put the needs of our city first, and politics second. I need to set the record straight on claims about the pay and allowances negotiations currently underway at Brighton & Hove City Council. The long overdue proposals being consulted on deal with historic issues we inherited from Labour and Tories that have to be resolved to complete the move to single status, which is the process to ensure fairness for all staff pay every council has had to do. The majority of staff, about 90%, will see little or no change to their total pay, and of those affected more will gain than see detriment. Any detriment will be compensated and we expect the total wage bill to rise slightly. Why are we having to consult staff on this at all? We need to go back to the founding days of the city council I serve on. Brighton & Hove City Council was formed in 1997 from the merger of Brighton Borough, Hove Borough and parts of East Sussex County councils. This, along with changes over the years since then, has left a complex arrangement for staff pay and allowances. Previous Labour and Conservative administrations made a number of abortive attempts to resolve what unions themselves have called a ‘mish-mash’ of allowances which all agreed need resolving. Whilst basic pay was eventually reformed, the final part of single status in the form of allowances was always ducked leaving the council in a risky and unsatisfactory position. When Greens became the largest party on the council in 2011 this was one of those incredibly difficult issues which we had to address. Sadly external factors mean the council cannot legally delay any longer, we must negotiate a new set of clear and fair allowances this year. Of the council’s £180m a year pay bill, these allowances make up £4m however the implications of these changes affect all staff. I make no apology for seeking to introduce fair pay and allowances for all staff from care workers, social workers to gardeners and waste operatives. Since Greens formed the administration our lowest paid all have and will retain bigger pay packets through our introduction of the Living Wage, where we have led the way in local government. Senior management pay is at its lowest level in over a decade. As a result we’ve closed the gap between highest and lowest paid in the council meaning it’s far more equal than when Labour ran the council. We have spent months exploring every possible option and reviewing how other councils handled similar issues before beginning negotiations with the recognised trade unions. Most councils handled changes to pay and allowances at the same time. Previous administrations took away that choice from us by dealing with basic pay only, leaving the allowances issue unaddressed. Along the way, up to the formal decision to begin the process, all three political group leaders on the council were regularly briefed on progress. At no point did any of them object to the process continuing. Labour are now retrospectively claiming that they did object vociferously, but I never witnessed this. Form your own conclusions as to why they now say they did object. The Green Group of councillors were briefed by officers on the plans before voting as a group to proceed. Hence a report was put to the council’s cross-party Policy & Resources Committee authorising the start of negotiations to be led by officers, as is appropriate for such a complex issue with weighty legal and financial implications. We had understood that none of the parties would vote against the report, though some councillors might abstain. As the meeting proceeded the two Labour councillors on the committee were deep in conversation and appeared to decide a new position then and there. Come the vote they unexpectedly voted against whilst the remainder voted for the report. Negotiations began in February and continued, on and off, until this month. This Tuesday 7th May the council’s offer as the employer was formally sent to the unions, staff and councillors. This marked the beginning of the ninety day staff consultation period with a huge array of group briefings, every employee receiving a detailed pack and one-to-one meetings for everyone with their manager. It is very clear that this is not about budget savings and not about ‘austerity’. In fact, based on the offer under consultation, the pay bill is likely to go up slightly. Which other Council in the country can claim that? With input from officers and unions, we have moved heaven and earth to produce the best possible offer which absolutely minimises detriment whilst remaining within legal and financial constraints. A new fair and simple set of allowances which is easy to understand and helps the council meet the needs of our citizens.With these new allowances 90% of staff will see very little or no change at all in their take home pay. Of those that do, the majority will actually see an increase and a minority will see some detriment. Most of those seeing detriment will, it is estimated, lose less than £25 per week. I recognise even that is a lot to some people, but not the headline figures being used by some individuals. Anyone who is unfortunately suffering detriment will be generously compensated for that loss with a lump sump payment. For example someone losing between £1,001 and £1,250 a year is proposed to receive £3,550 in one-off compensation. We are keen to provide new opportunities for staff. We hope that, if agreed at a future committee, changes like Bank Holiday working can increase opportunities for waste and recycling staff whilst improving services to the city by eliminating changing collection days every time there is a Bank Holiday. We shouldn’t prejudge the consultation: Staff need to be given the chance to consider the proposals, how it might affect them and offer their feedback. We also need to be mindful of any negotiations which might happen once the consultation period ends. We have to resolve these allowances now. To do so without any detriment to any member of staff would sadly be totally unaffordable, even with Council Tax rises that would certainly not be supported by Labour and Conservative councillors. It is also important to remember that Brighton & Hove is the second worst-cut council of its type in the country. Being simply against any detriment to anyone might be ideologically pure, but doesn’t offer any solutions to the immediate situation the city council finds itself in. The Labour Party are not interested in the rights and wrongs of this important issue, and are cynically using it as a stick to beat the Green administration whilst knowingly not telling people the whole story. It is worth re-iterating that this is not about saving money, the offer will cost more. Most staff are unaffected and the majority of those seeing changes will benefit. Those seeing detriment will be compensated. Despite the incredibly difficult times for our council, facing brutal Tory-LibDem cuts to our funding, we know how important it is to resolve this matter so we are funding the compensation and the slight increase in the wage bill to deliver a fair outcome. During the consultation period I know that everyone involved remains open to any suggestions from staff and unions which could further improve the offer. Change is a difficult process for staff affected and to bring in those changes as a minority administration, but it is absolutely the right thing to do for the long term wellbeing of the council, it’s employees and everyone it serves. Nobody who knows all the issues denies that it has to be done, and that other parties have failed to finish the job when they had the chance. With the success of this process I believe that once and for all we can have a council with a clear and fair pay and allowances system. At last. Jason Kitcat is a Green City Councillor. 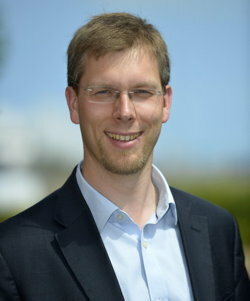 He is writing in his capacity as Convenor of the Green Group of councillors on Brighton & Hove City Council. You can read more about the offer being consulted on here. I understand that there will be a debate about the Mobile Library today. Both as a local author and in my capacity as Chair of the Crime Writer Association, I write to you to implore you, from the bottom of my heart, to please look favourably on saving this valuable part of our library network. If it had not been for the libraries, when I was a child growning up in Brighton, I don’t think I would ever have become a writer, for was in those that I discovered my love of books. In today’s harsh economic times, fewer and fewer people are able to afford book, and libraries are their lifeline. The mobile serves so many people, including the elderly and equally importantly youngsters with decreasing access to books, as more and more high street bookstores close. I think that a city like ours really must support literature in every possible way. I know resources are stretched, but the cost of this service is very small in the overall scheme of things, and what it brings to the community is something quite priceless. Many thanks for taking the trouble to write to me. Like you I am a great fan of mobile libraries, but there are some rather steep costs involved in keeping one on the road. We have been exploring all kinds of ways to achieve this but, in the end, have been forced to concede that it is simply not possible. Here are some facts which will provide you with some of the background to the reluctant decision to end the service. We live in extremely difficult financial circumstances and if the Government was not stripping out £30 million from the council’s grant and restricting us raising money via the Council Tax to pay for all vital services, we would be able to contemplate purchasing a new vehicle and keeping it on the road six days a week. Sadly that isn’t the economic situation in which we find ourselves. The upside of this otherwise sad tale is that, unlike Labour and Conservative run councils throughout the country who are closing down libraries wholesale, having long abandoned their mobiles, the Green administration has managed for a second year running to keep all its static libraries open. In fact we are about to build a new one in Woodingdean (replacing a 50 year old temporary Nissen hut with a state of the art library and medical centre). I am sorry this is not the answer you hoped for, but sometimes we are forced into making tough decisions and this, sadly, is one of them. I really appreciate your taking the time and trouble to respond in such detail, thank you very much. Certainly your points and argument here make sense, and it is at least encouraging to know about the home delivery service. Meantime on a very positive note, you do all have to be congratulated on keeping the static libraries open, and it is extremely good news to hear about Woodingdean. All my best and again, thank you for such a reasoned and thorough explanation. The views I express on this site are not necessarily a reflection of the views or policies of organisations I work for or am a member of. Items are posted here in a personal capacity as an individual. EJ on Why no NHS osteopathy in Brighton & Hove?